One regular feature of the Worldwide Ferry Safety Association’s (WFSA’s) annual conference is its ‘Design Competition for a Safe and Affordable Ferry’ – and this year’s gathering, hosted in New York City in March, did not disappoint. For this year’s contest – the fifth, to date – the WFSA challenged student teams to produce the design for a 300-pax capacity ferry operating in the Singapore Strait, between Singapore, Indonesia and Malaysia. First prize was clinched by ‘Team Singapore’, comprising representatives from Singaporean institutions Nanyang Technological University and Singapore Management University, as well as Newcastle University, UK. Headed by captain Marcus Teo Tze Kang, this team presented the SolarJet concept, intended to provide a stable, environmentally clean means of transport. This optimised stability, says Teo Tze Kang, means the ferry can be built ‘ballast-free’, reducing lifecycle and maintenance costs as well as vessel weight. Teo Tze Kang estimates that the SolarJet’s own ‘Powerwall’ battery would take six to seven hours to charge and would grant the vessel a range of approximately 130 miles. Given the tropical climate of the Singapore Strait, there should be no significant drawbacks to keeping the battery topped up. 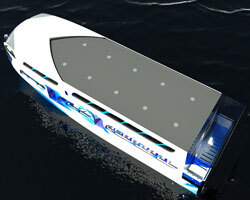 In addition to its solar power grid, the vessel would be fitted with medium-speed diesel engines and a triple-waterjet arrangement– the latter providing enhanced manoeuvrability and low noise levels. Two gangways should result in swift embarkation/disembarkation times for all passengers, and also enable timely evacuation in the event of an emergency. The ferry will also feature foldable chairs, to facilitate wheelchair access, and “specially designed lighting, to allow for light to be distributed well throughout the cabin”. LED lights would result in an energy saving of 30% compared to fluorescent lighting, he says.